Yes, Fred Astaire and Ginger Rogers sang and danced about different, but acceptable alternative pronunciations (in roller skates, no less!) in the classic film, "Shall We Dance." If you are struggling to find the perfect way to say a word, you may be relieved to know that there are often a few acceptable options. Sometimes, it depends on what region you live in. Regional dialects may have different pronunciations, and even different word choices. For example, do we drink soda or pop, eat heroes, subs, or hoagies? Our first suggestion is to listen to how people say it in your region. For example, we may hear various pronunciations or stress patterns for "New Orleans," or "Oregon." Some say "New ORleans" and others say "New OrLEANS" or "ORegin" vs. "OreGone." Names of cities often have pronunciations that do not always follow the phonetic rules. "Taneytown" is pronounced "Tawneytown" and "Staunton" is pronounced "Stanton." If you are in the Massachusetts area, you would be challenged by many cities such as "Barnstable" pronounced as "Barnstuhbul" or "Worcester" pronounced as "Wooster." There is no right or wrong. Different regions have their own pronunciation for places and names. Check out our Boston RULES to learn how you can address some word choices and pronunciations of the New England Area. How Do We Say Halloween? The topic of Halloween came up with one of my non-native English speaking speaking clients. He asked me why we stress the last part of that word, e.g., "HalloWEEN." It got me thinking.....Halloween was originally called All Hallow's Evening. "Evening" was shortened to "e'en. " So we are actually saying an adjective +noun and should therefore stress the noun, "e'en". Holidays with the word "day" are treated as compound nouns. Stress the first part of the holiday. Note: when we use "day" with multiple words, resort to the adjective + noun or proper noun rule, e.g., St. Patrick's Day, April Fool’s Day. Then, we have holidays that are derived from other languages. Notice, with most 2-3 word holidays, we stress the last part. What other holidays can you think of? Let us know. It’s a challenge to integrate pronunciation objectives into an already packed ESOL curriculum. Other curriculum priorities, time constraints, and teachers’ comfort levels often leave pronunciation and suprasegmentals at the bottom of the list. How can we seamlessly integrate these objectives into the current curriculum? By learning the stress, intonation, and pronunciation rules that guide American English, ELL (English Language Learners) students can adopt a more listener-friendly communication style, gain confidence, and succeed both academically and professionally. There are specific rules that help the ELL master the suprasegmentals and pronunciation of American English that can be incorporated into other activities. When a word or syllable is stressed, it is produced with a higher pitch, louder voice, and longer vowel. Compound Nouns: Stress the first part of a compound noun, e.g., laptop, whiteboard, midterms. Proper Nouns: Stress the last word, e.g., United States of America, United Nations, The Language Institute. Past Tense: If the last sound of the verb is voiced, pronounced the ending as “d”, e.g., listened, loved; if the last sound is voiceless, pronounce the ending as “t”, e.g., walked, coughed, and if the verb ends in “d” or “t,” add an extra syllable, “ed,” e.g., waited, coded. The written text can be highlighted to identify the rule patterns. Provide the students with any text to read.1 Highlight the rules with an assigned color.2 Practice reading sentences aloud while following the pronunciation pattern for that rule. This will give the ELL student a practical way to focus on suprasegmentals while addressing other classroom objectives. Help your students learn the rules for clear and comprehensible speech while still accomplishing your curriculum objectives. 1 Feinstein-Whittaker, M and Wilner, LK, RULES By the Sound, Owings Mills, MD: Successfully Speaking, © 2009. 2 Feinstein-Whittaker, M and Wilner LK, RULES on the Run, Owings Mills, MD: Successfully Speaking, ©2014. Is it "ate" or "it"? Our clients who speak English as a Second Language (ESL) and are enrolled in accent modification training are often are perplexed by pronunciation RULES. How do we pronounce “-ate” when it appears at the end of a word? We've covered this in our RULES student workbook, but let’s look at more examples. The World Dictionary defines the “-ate” suffix in the following manner: For adjectives, it is used to denote the appearance or characteristics of the noun, e.g., fortunate. For nouns, it denotes an office, rank, or group with certain functions, e.g., senate, electorate. These words can also become verbs, e.g., separate, graduate, liberate. The pronunciation changes according to the part of speech. The same word that can be used as a noun/adjective or a verb, but is stressed or pronounced differently and has a different meaning, is called a heteronym. Check our video on two and three syllable heteronyms. Let us know of some more examples that you found. Check out more RULES in RULES Student Workbook. Contact us to learn how to master the RULES. There are many more examples of silent letters in the English language, and exceptions to the “RULES” mentioned above. Let us know which words you can find. To learn more about pronunciation variations for English consonants and vowels and practice their pronunciation variations, please see RULES By the Sound. the RULES by the Sound Pronunciation Platform, and RULES: Rules for Using Linguistic Elements of Speech. We have all done it! Regardless of whether or not English is our first language, sometimes what comes out of our mouths isn't what we intended. Definition: an amusing error that occurs when a person mistakenly uses a word that sounds like another word but that has a very different meaning. We are collecting examples of this entertaining verbal missteps. Please add any ones that you encounter. Gloria, in Modern Family, is a master of mispronunciation and malapropisms. This clip captures both the humor and the frustrations of non-native English communication. Can you give me a little more background on that particular problem and how you handled it? Can you tell how that issue finally got resolved? Finally, make sure that the candidates take advantage of the opportunity to ask YOU questions (by Joseph). If they don’t inquire, it may mean that they haven’t done their homework about the position, or the company. Remember, specific skill training can happen on the job, but you need to make sure you hire someone who will fit in with the culture of your company, and the other employees who may be part of the team. We understand that it is very difficult to squeeze independent accent modification homework into an already hectic day. One of the best and easiest ways to reinforce what you have learned during the week is just to read out loud as many times per day as possible. Think of all of the reading materials you come in contact with on a daily basis. Take a few moments to read the first few sentences aloud, making sure to accurately produce a target sound, use appropriate word or sentence level stress, practice voice projection, or reinforce any of your new speech and communication goals. Make a point to read as much as you can out loud every day! You will make a significant dent in your practice time! Contact us at info@eslrules.com for more independent practice ideas. Is it "S" or "Z"? A common conundrum for many non-native English speakers is how to pronounce “s” in a word. Is it pronounced “s” as it appears or “z”? How do we know? Can one differentiate “diseased” from “deceased”? If not, the message can certainly be misinterpreted, e.g., “The patient is diseased/deceased.” So, in an attempt to clarify some of the English patterns and make some sense to the idiosyncrasies of American English, we organized some patterns or RULES for the pronunciation of “s”.Of course, there are exceptions, and we welcome your feedback and any patterns that you have observed that may be helpful to English language learners. It is more challenging to determine the correct pronunciation when “s” appears in the middle or endings of words. It certainly appears that in the middle of words, “S” is usually pronounced as something other than “S.” So, unfortunately, we must rely on memorizing the patterns that you see above. If you find more rules or more exceptions, please let us know! The fine art of listening-We are all used to multi-tasking and pride ourselves on being able to accomplish numerous things at once. However, to be a good listener, particularly in the workplace, we have to truly focus on our conversational partner(s). 1. Timing is everything: Don’t start a conversation when you have to dash out the door to a meeting in 3 minutes. Allow yourself 15-20 minutes when you can devote the necessary time and attention to the conversation. 2. Select a private and quiet place: Close the door to your office, or go for a walk around the perimeter of the building. That way you won’t have to worry about co-workers eavesdropping at inopportune moments. 3. Be open-minded: You may have strong opinions, but make a conscious effort to hear alternative viewpoints and ideas. 4. Observe non-verbal cues: Look at the speaker, which will help you "read" any non-verbal communication (impatience, distractibility, annoyance). 5. Minimize distractions: Turn off phones and beepers (or put on vibrate), and have portable devices and computers out of reach, and out of immediate view. It is just too tempting to quickly check messages and e-mails. 5. Write it down: Keep a pen and pad handy to keep notes, if appropriate. 6. Keep the conversation going: Maintain good eye contact, nod your head, smile and lean slightly toward the other person to convey interest. 7. Provide verbal/vocal feedback: Demonstrate that you are following the conversation. Use phrases such as, "I see," "I understand," "So what you are saying... ," or "um-hmm." 8. Be honest: If you don’t understand what is being said, or the message behind it, don’t nod as if you are following. Be direct and honest. Use phrases such as, "I’m not following, you," "I don’t understand," "Can you explain what you mean? ", etc. For more information about communication skills in the workplace, contact info@eslrules.com. What is the Pronunciation RULE for "X"? Several of our clients have asked us the pronunciation rule for "X." Some make the mistake of pronouncing it as "S." Many do not realize that "X" is a combination or cluster of two sounds; "K" and "S," as in "six" (pronounced as "sicks"). When it is at the end of the word, we pronounce it like "ks," as in "fax", "mix," or even "next." However, in some circumstances, it is pronounced as "GZ" as in "exam" (pronounced as "egg-zam"). So, what is the rule? When is it pronounced as "KS" and when as "GZ"? Let's look at "X" when it is in the middle of words. When the "X" is followed by a consonant, it is usually pronounced as "KS." When the "X" is followed by a vowel, it is usually pronounced as "GZ." When there is a silent "H," we treat the word as if it were followed by a vowel: exhausted, exhibit, exhume, and exhort , but not "exhale." Remember; "X" is a consonant cluster which means you must pronounce two consonants. It will be either "KS" or "GZ." For more RULES to help you pronounce American English, visit us at www.eslrules.com. A lot of what we “say” has nothing to do with speech at all. Dr. Albert Mehrabian conducted a study in 1982 about the likability of strangers. Communication was divided into vocal (how we sound), visual (how we look), and verbal (what we say). The visual aspect of communication was 55% of the impact! (Vocal was 38% and Verbal was 7%). These results have often been misinterpreted and were used to determine only one word utterances. Regardless of the actual results, the importance of nonverbal communication cannot be overlooked. Visual/non-verbal communication including posture, gestures, facial expression, and eye contact, are critical to accurately and effectively communicate our thoughts and ideas. We often make our first impression with non-verbal communication. What is your first and lasting impression? Your visual message should be consistent with what you say (verbal) and how you say it (vocal). Your body language SPEAKS volumes! Find someone whose speech is pleasant to your ear. This can be a radio or TV personality, a family member, friend or colleague. Do you like the tone, rate of speech, resonant quality, phrasing? Try to emulate those desirable features in your own communication. It is difficult to change aspects of your speech if you don’t know what may be detracting from the effectiveness of your communication. Find a specialist who can help you identify areas that may need improvement. Make sure to check references! This can be as low or high-tech as you please, but it is very helpful to hear and see how you may present yourself to others. Consider how you look (fidgeting with your hair, wringing your hands, pacing), how you sound (monotone, rapid-fire, nasal, whiny), and how you speak (using professional language or too much slang, rambling or concise)? If you feel as though your communication may be holding you back at work, ask your manager, co-workers, and others for honest feedback. Seek people who interact with you in a variety of settings such as on the phone, in meetings, during formal presentations, etc. Take deep abdominal breaths and speak as you exhale; do not waste any air. Keep your mouth open and relaxed. Look in the direction you want your voice to go and imagine your breath stream floating along a string to your target (the person or object farthest away from you). Take replenishing breaths as needed so the end of your sentence sounds as loud and strong as the beginning. Stand up when speaking. Try to speak with a natural, varied inflection pattern. Stress the last important word in a thought group. Stress the word by slightly raising your pitch, , speaking slightly louder, and lengthening your vowels. If you just use a louder voice, you may sound angry. Smile to infuse a little more energy and/or personality in your voice. Use every speaking situation as an opportunity to practice your best speech techniques. Listen and observe the reactions/responses to your speech from your mail carrier, doorman, barista, newspaper vendor, secretary, etc. Everywhere you look, you will see proper nouns (business cards); compound nouns (grocery store circulars); numbers (appointment books), and other written references to pronunciation rules. Use every opportunity to read aloud practicing your newly learned techniques for proper stress and intonation. Contact us at info@eslrules.com if you have any questions. Like it or not, we live in a technologically changing world, which has impacted all areas of our lives, especially the workplace. For the most part, these advances are useful and contribute to our efficiency and success. E-mails and virtual meetings have revolutionized the way we conduct business. People are learning the rules of "netiquette," and can now email without offending the readers with all CAPS or annoying them with the overuse of emoticons! But where does texting fit into the equation? Yes, it is instant, and efficient, but the biggest pitfall that we see is the lack of a paper trail. Admittedly, many of us are trying to be green, and do more in less time, but is texting a good workplace practice? Lately, we have been receiving more and more text messages related to work. We have heard recruiters and management complain that employees are texting in to report absences or appointment changes. Texts are harder to read, difficult to save, and add an extra layer when we need to print them out or forward them. Sometimes you just need a paper trail! Although texts are great for letting someone know you are running late for a meeting, or communicating with friends or family members, we believe that lengthy, confidential, or contractually-oriented messages just don't work on a Smartphone. 8. Learn your company's policy regarding texting in the workplace. Please let us know if you agree or not! And please respond don't text your response; respond below in the comments section! Whenever we hear it, we really do want to cringe, especially when it is during a formal presentation made by an otherwise intelligent, sophisticated woman. It is about as effective as shooting oneself in the foot! However, for many of our clients, ending a sentence with a rising intonation pattern denotes friendliness in their culture (e.g., Turkey, Romania, etc.). There also is a trend among well-educated consultants to use up-talk to reflect a collaborative relationship with their clients. So what are we as trainers to do? First, explore why your client is using that type of speech pattern. Is it unconscious or is it intentional? Explore intercultural and work-culture influences. If you and your client decide that habitual use of “up-talk” is detracting from the delivery of the message, here are a few techniques to work on it. 1. Use audio or video recordings. As with most speech habits, just hearing your own voice can bring the necessary awareness to a speaking style or habit. 3. Practice saying the same sentence using 3 different inflection patterns, and talk about how the messages come across. For example, a rising inflection typically indicates surprise, uncertainty; a falling pattern indicates authority or certainty, and a partial rise indicates that more information will follow. Try the following examples out and see what we mean. a. Yukiko doesn’t like her job. b. Our grades were posted. c. We have a conference call at seven a.m.
d. Kayla invited 400 people to her wedding. e. Kit speaks five languages fluently. If you need help coming across as a capable and effective speaker, contact us at info@eslrules.com. Everyone who works with nonnative English speaking college students understands the cultural differences that comes with living and studying abroad. There are so many adjustments that must be made. Everything is unfamiliar from getting around and using public transportation, buying and ordering food and beverages, dealing with housing considerations, money, social customs, etc. But another challenge that rarely gets attention is the philosophical and practical differences in the educational system. 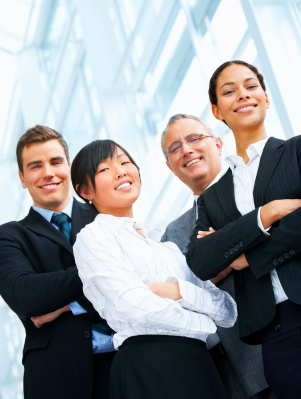 These cultural differences may ultimately influence behavior in the workplace. One of our clients shed some light on what he has observed between his education in China and his experiences at Northeastern University in Boston. - Classes are primarily straight lectures. - Classes are more discussion oriented. For this client, and many others like him, students need help “fitting in” to the American classroom. It is often useful to address pronunciation, conversational skills, vocabulary and general topics related to culture so that students can actively participate in their education, and enjoy and appreciate their American educational experience. This will also help them as they enter the workforce in the USA. Many of our clients reveal their nervousness, particularly in public speaking situations, by giggling. There may also be a cultural component to this reaction. However, in the USA work environment, giggling detracts from a speaker’s credibility, power, and effectiveness. What can be done to curb this behavior? One of the best techniques to bring this behavior to your clients' or employees' attention is to videotape them during their sessions or more formal presentations. Once they are aware of the behavior, we have found it helpful to track the frequency of occurrences, so they can note a decrease over time as they learn to some practical strategies. 1. During every session, keep a running log and mark off a blank sheet of paper with check marks or hash marks every time the behavior occurs. You can track occurrences during spontaneous conversations or structured tasks. 2. Keep track of the number of times the client can successfully inhibit the behavior with gentle reminders, such as modeling a slow, deep breath. 3. Track the instances when the client self-monitors and self-regulates using trained strategies. - Distract yourself; look around the room and silently name what you see, e.g., "white walls," "green carpet," "wooden desk"
- Silently counting to five. If you need additional help controlling your nervousness, contact us at info@eslrules.com.